Sgt. 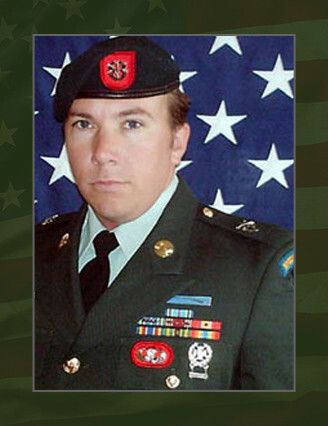 1st Class Allen C. Johnson, 31, was a Special Forces medical sergeant assigned to 1st Battalion, 7th Special Forces Group (Airborne), at Fort Bragg N. C.
Johnson died April 26, 2005, when his unit was attacked by enemy small arms fire during a combat foot patrol in Khanaqin, Afghanistan. A native of Los Molinos, Calif., Johnson entered the Army in October 1991 as an infantryman. After completing infantry and airborne training at Fort Benning, Ga. in February 1992, he was assigned to 2nd Battalion, 75th Ranger Regiment at Fort Lewis, Wash. In 1994, he was assigned to the 2nd Armored Cavalry Regiment at Fort Polk, La., and later served with 1st Battalion, 509th Infantry Regiment there. After changing his military occupational specialty from infantryman to corrections specialist in 1996, Johnson was assigned as a team leader to the U.S. Disciplinary Barracks at Fort Leavenworth, Kan. After being reassigned in 1998 for two years with the 704th Military Police Battalion at Fort Lewis as a squad leader, he was accepted into Special Forces training at Fort Bragg. Johnson arrived at the 1st Special Warfare Training Group (Airborne) in April 2000 to begin the more than two years of intense training it would take for him to become a Special Forces medical sergeant. He was assigned to the 7th SFG in July 2002. Johnson’s military education includes the Basic Airborne Course, the Primary Leadership Development Course, the Basic Noncommissioned Officer Course, the Special Forces Qualification Course and the Survival, Evasion, Resistance and Escape Course. His awards and decorations include the Joint Service Achievement Medal, the Army Achievement Medal, the Good Conduct Medal, the National Defense Service Medal, the Global War on Terrorism Expeditionary Medal, the Global War on Terrorism Service Medal, the Noncommissioned Officer Professional Development Ribbon, the Army Service Ribbon, the Parachutist Badge, the Expert Infantryman Badge and the Special Forces Tab. He was posthumously awarded the Silver Star, the Bronze Star Medal, the Purple Heart, the Meritorious Service Medal and the Combat Medical Badge. Johnson is survived by his wife, Eunice, and three children, Stacy, Naomi and Joshua.